Astronomers from the Harvard-Smithsonian Center for Astrophysics use Spitzer observations to study the massive star forming regions W5-east, S235, S252, S254-S258 and NGC7538, revealing clusters of massive new stars. Over ninety percent of the stars in our galaxy were born in stellar nurseries, clusters of stars nestled deep within clouds of dust and molecular gas. These young natal environments are key targets for astronomers who study star formation because they retain imprints of the initial conditions that produced the stars and the dynamical environments under which they evolved. Clusters with massive stars (stars more than a few solar masses in size) are of particular interest since both the formation of massive stars and their impact on other cluster members are poorly understood, for several fundamental reasons. Massive stars begin hydrogen burning while they are still growing and hence quickly develop strong winds and ultraviolet radiation that inhibit their further growth while at the same time disrupting the nursery with shock waves and ionizing light. Moreover, because massive stars evolve quickly they do not linger in any particular stage of development long enough for easy study, and they remain obscured by the not-yet-disbursed natal dust. None of these issues applies to the formation of lower mass stars. CfA astronomers Luis Chavarria, Joe Hora, Gus Muench, and Giovanni Fazio and two colleagues undertook a study of massive stellar clusters with the Spitzer Space Telescope, whose infrared camera can peer inside dusty regions. They chose five massive clusters relatively nearby (about six thousand light-years) and performed a detailed census of their populations using the infrared colors of the individual stars to characterize the clusters’ sizes and stages of development. The astronomers report finding 3021 young stars in their set of five clusters, a large enough sample to draw significant conclusions. The youngest group of these stars, a subset of 539, are found in regions where the cloud material is densest, supporting the general picture of cluster formation. 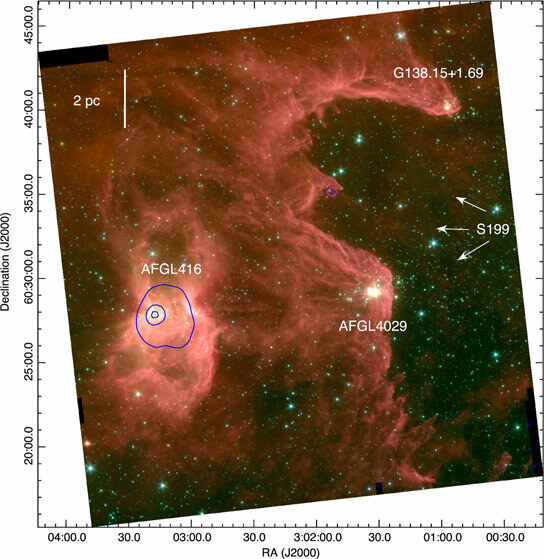 The scientists also find that massive young stars form preferentially in filamentary (rather than spherical) structures that subsequently fragment, probably due to turbulence effects. Be the first to comment on "Spitzer Reveals Clusters of Massive New Stars"